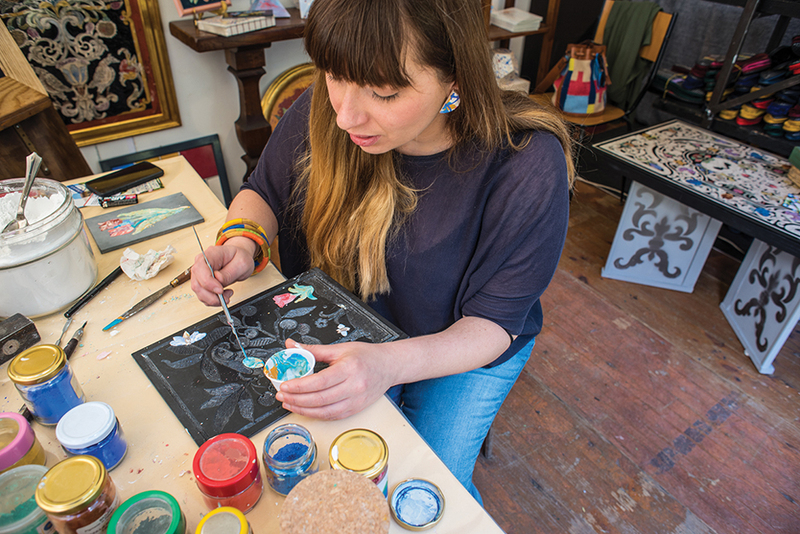 The rich history of fine craft in Florence inspires a new generation of artists and patrons. Published on Monday, March 25, 2019. This article appears in the February/March 2019 issue of American Craft Magazine. Dominating the city center is the famous Duomo by seminal Renaissance architect Brunelleschi. It’s easy to be swept away by Renaissance art in Florence: Botticelli paintings in the Uffizi Gallery, Masaccio frescoes in the Brancacci Chapel, sculptures by Michelangelo and Donatello, and Brunelleschi’s spectacular dome atop the Cathedral of Santa Maria del Fiore. Many threads connect this prosperous period to the artisans working in Florence today. Steps from the Medici Chapel, built by the powerful Renaissance family of popes, politicos, and arts patrons, makers squeeze into narrow shops, working in materials from leather and silver to stone, feathers, even gourds. Despite the city’s rich artisan history, modern makers can still struggle to support themselves, however. Fortunately, a few benefactors and design enthusiasts are stepping up to promote them. One such patron is Princess Giorgiana Corsini. 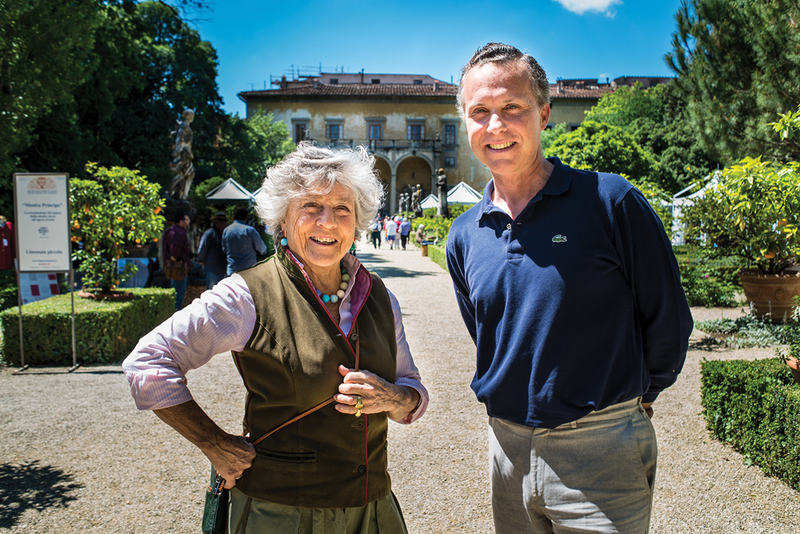 Every May since 1995, she has opened the gates to the Corsini Gardens, her private estate in central Florence, inviting the public to mingle with 100 select artisans. The annual Artigianato e Palazzo show provides “the stimulus to appreciate things that are beautiful and rare,” she says. 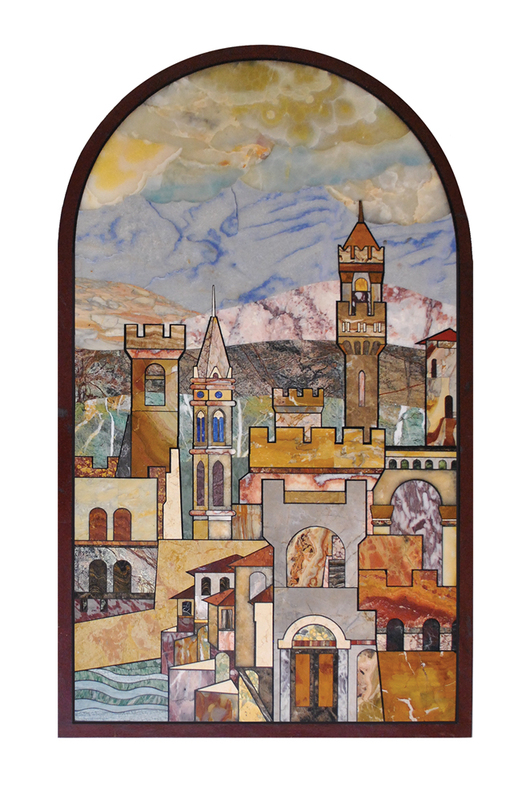 An abstraction of Florentine architecture and the storied River Arno by Cecelia Falciai, who continues the venerable tradition of scagliola mosaic. 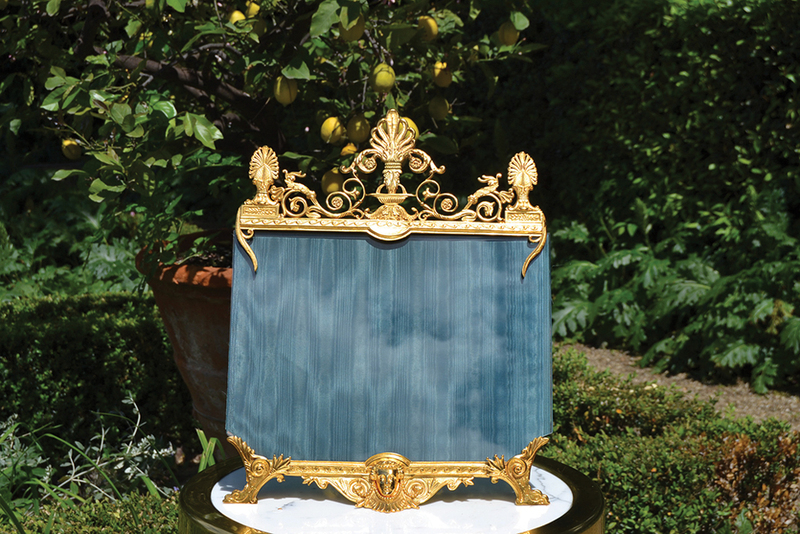 Giorgiana Corsini and Neri Torrigiani founded the Artigianato e Palazzo craft showcase 25 years ago, hosted on the grounds of Corsini’s Florence estate, to support makers and inspire a new generation of patrons. Cecilia Falciai has been among a select group of artists participating in the event. Duccio Banchi, who works in brass and bronze, has been among a select group of artists participating in the event. Laura Fair’s silk-screened linens are inspired by the hues of the Italian landscape. The Richard Ginori company has been producing porcelain wares since 1735. A bracelet from the Paolo Penko atelier was inspired by Botticelli. 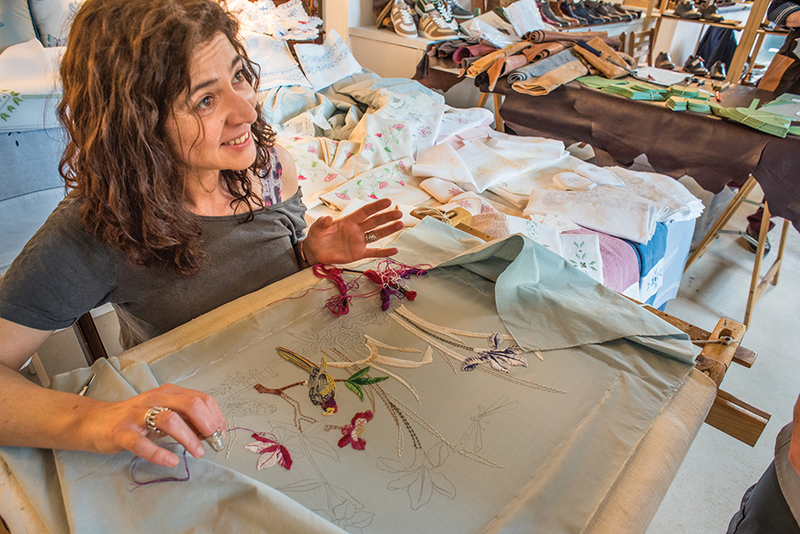 Third-generation embroidery artist Lara Viviani of Iris Recami with a work in progress. 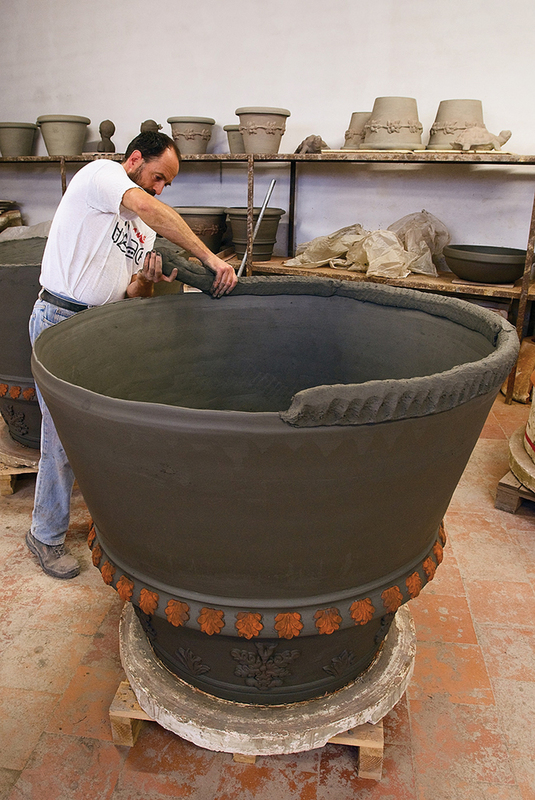 Pesci Giorgio & Figli creates vessels and sculpture with local clay. 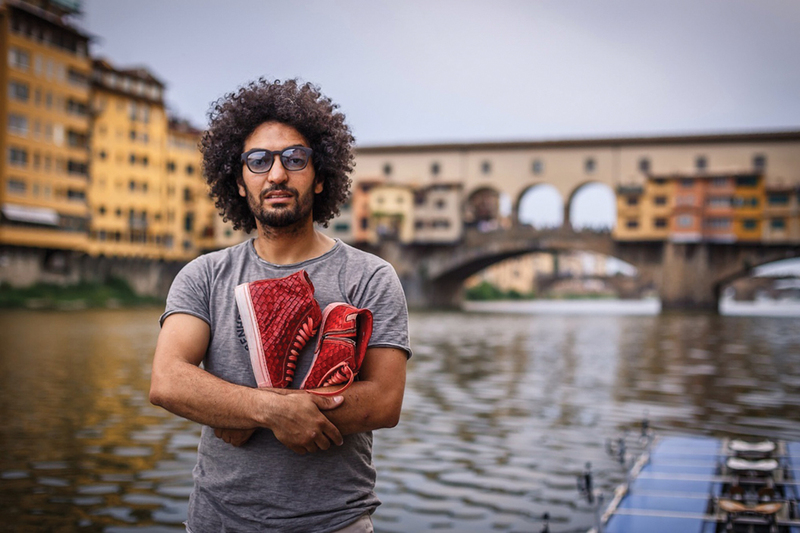 Hicham Ben’Mbarek co-founded Benheart to carry on Florence’s reputation for quality leather goods. Clizia Jewelry uses both precious metals and modern materials such as nylon. Maria Paola Pedetta of Dejamis recycles fur coats into mod bespoke wearables. As her knowledge and appreciation of the crafts grew, Corsini also saw great potential in the large glass conservatories that house the garden’s lemon trees in cold months. Around that time, she met designer and promoter Neri Torrigiani, who was looking for a space to host an event that would combine his interests in fashion, design, and communications. 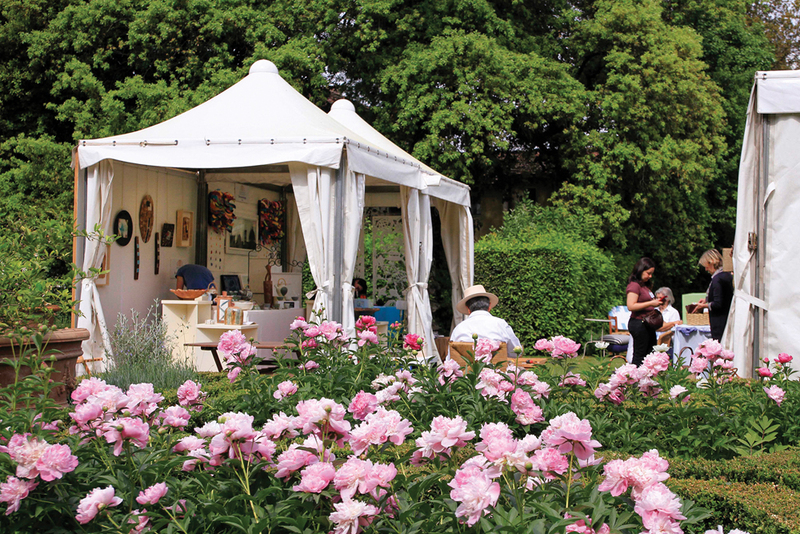 The Corsini Gardens, still maintained in the formal Renaissance style some 400 years later, proved to be the perfect spot, and the Artigianato e Palazzo show was born. The garden’s setting “opens the most beautiful window” onto the event, Torrigiani says. Under the guidance of Torrigiani and Corsini, the event continues to evolve. Since its 20th anniversary in 2014, a segment has been devoted to “Blogs and Crafts,” featuring 10 artists under 35 who are paired with bloggers or videographers to document their work. Using social media to promote the work of emerging makers is one example of how Corsini supports artists with modern-day tools. Each year, a featured exhibitor demonstrates their craft. 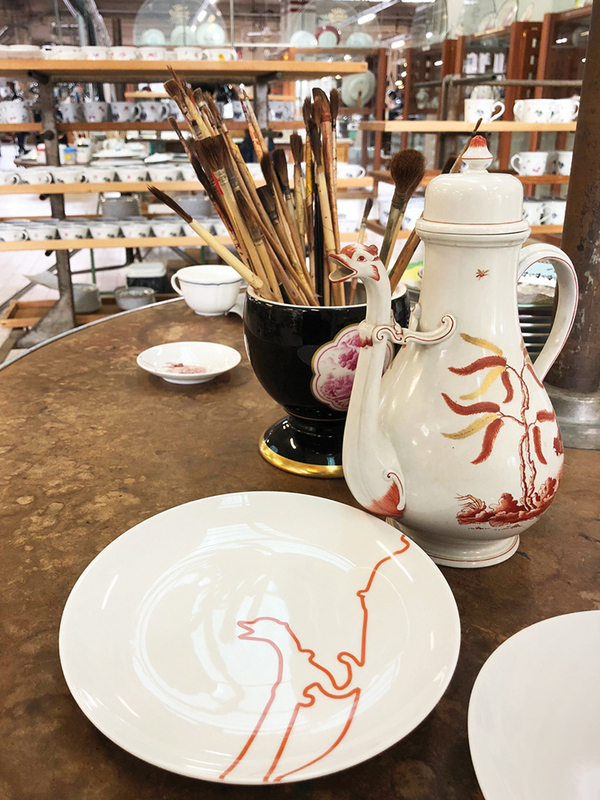 Last spring, the Richard Ginori porcelain company from nearby Sesto Fiorentino presented work in various stages, teaching visitors about their molding, carving, glazing, and firing processes. The company, which has products in museums around the world, has been manufacturing porcelain since 1735 and still employs 250 makers. The artisans point out that the motifs they work with may be traditional, but they’re combined in fresh designs. Embroidery artist Lara Viviani of Iris Ricami works in a similar vein. “I take the old designs and remake them in a new way,” she says. “I create as I go.” As she says this, Viviani reconsiders the color and direction of her next stitch, the turn the flower’s stem will take. Behind her, her mother, Iris – the company’s namesake and the second of three generations in the business – also pulls at a needle. Though their cloth and thread are the same, their designs inevitably differ. 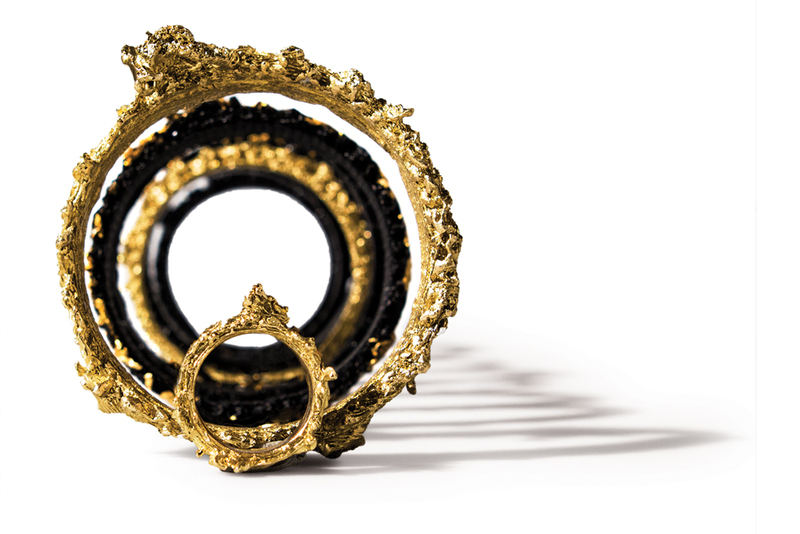 Alessandro Penko, a fourth-generation goldsmith and jeweler, also reinterprets enduring motifs. Based on the Florentine style of engraving texture in the metal, his designs often combine floral and geometric patterns in white and yellow gold. He holds up an elaborate bracelet inspired by the flowers in Botticelli’s Primavera painting as an example. Despite the fair’s success rousing broad interest in craft and providing opportunities for makers, the pool of working artists in Florence has shrunk by about 20 percent over the past two decades. Many struggle to stay in business or to inspire the next generation, Corsini says. That makes events such as Artigianato e Palazzo even more important. 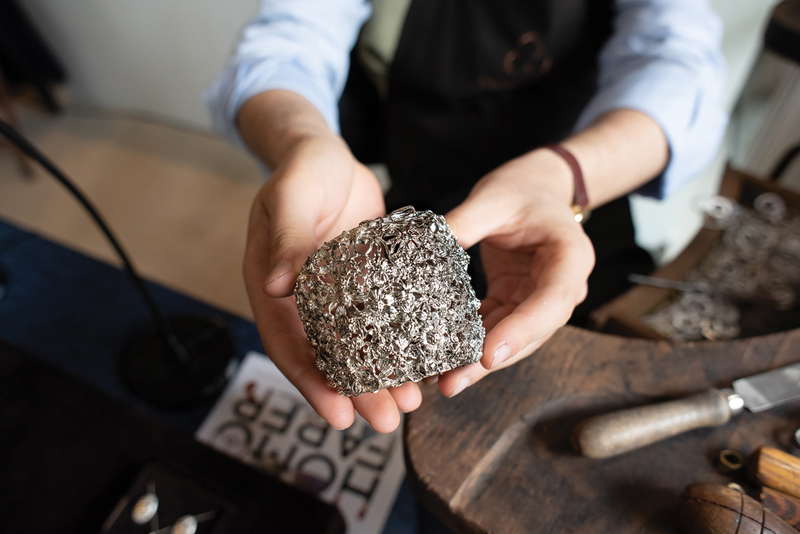 Around Florence, tourists can join residents in watching, learning, meeting artisans, and, in their own way, supporting the future of Florentine craft. The Corsini Gardens are just a 15-minute walk west from the Duomo in the Porta al Prato neighborhood. Besides the spring Artigianato e Palazzo show, the grounds open for other events, including August’s New Generation Festival of music and performing arts. The relatively quiet streets in this area are home to antique stores and design showrooms, including the Richard Ginori porcelain shop. Not far from the gardens, find extraordinary leatherwork such as the handmade wallets of Il Bussetto, or the Benheart store’s fine leather shoes, jackets, belts, and bags designed and made in Italy. The new showroom Brandimarte displays stunning silverwork, including glasses, decanters, jewelry, and decorative pieces. Just behind the Duomo, visit the workshops of Paulo Penko, featuring four generations of goldsmiths specializing in jewelry and watches. Oltrarno, which translates as “the other side of the Arno,” the river that bisects Florence, is considered the city’s main artisan district. One of its central attractions is the Church of Santa Maria del Carmine, famous for the Masaccio frescoes in the Brancacci Chapel. Spend a day checking out a whole gamut of craft disciplines, including unique adornments at LAO (Le Arti Orafe) jewelry school, artisan Duccio Banchi’s bronze work, wallpaper and other interior décor at Tommaso de Carlo, and the classic glass and crystal work at Moleria Locchi. To get a jump-start on your visit, sign up for an excursion led by Context Travel, whose small-group, docent-led tours get you behind the scenes. The centerpiece of Florence is the Duomo, also known as the Cathedral of Santa Maria del Fiore. Allow plenty of time to gaze at this marble masterpiece. Tickets include entry to the baptistry, cathedral, bell tower, and dome, plus admission to the impressive Museo dell’Opera del Duomo, home to many of the cathedral’s original sculptures, including Michelangelo’s Pietà and Donatello’s Penitent Magdalene. Find more work by Donatello at the nearby Bargello Museum, which specializes in sculpture. The museum also boasts a surprisingly large collection of textiles, bronze reliefs and medals, mosaics, and majolica. A 10-minute walk east is the Santa Croce neighborhood. No visit to Florence is complete without a taste of ice cream from Vivoli, the legendary artisanal gelateria in business since the 1930s. From there, walk a few minutes east to the shop of Cecilia Falciai, a new master of an old art. Falciai specializes in Florentine mosaics and scagliola, the technique of incising stone filled with a mixture of selenite powder, glue, and natural pigments to achieve a marbled effect. 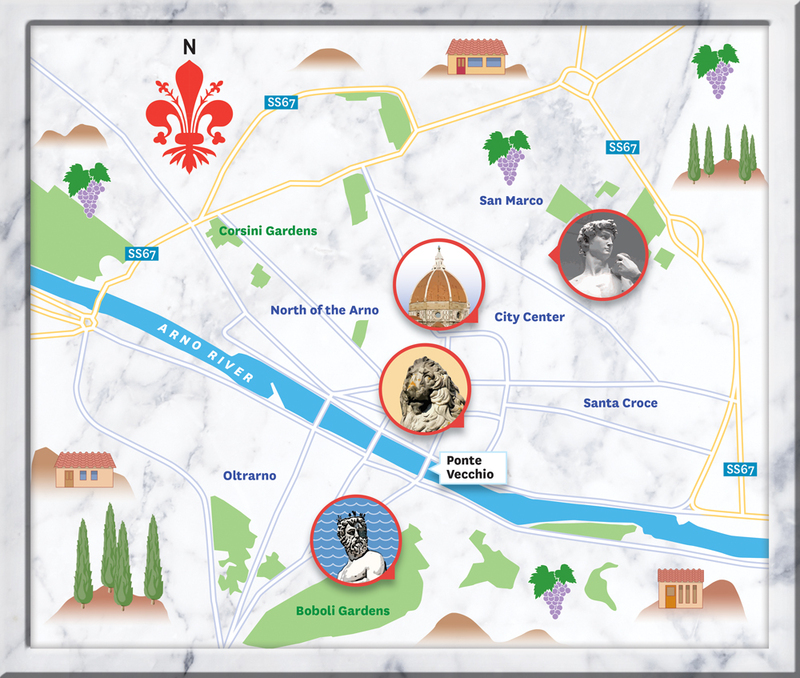 The most popular destination in this neighborhood north of the Duomo is the Galleria dell’Accademia, home to Michelangelo’s David as well as four of his Prisoners. The Accademia also displays a sizable collection of paintings, sculptures, and historic musical instruments, including a Stradivarius violin. For an artistic about-face, visit the studio of Clizia Jewelry. These contemporary rings and bracelets seem to fly off the wheel of tradition. 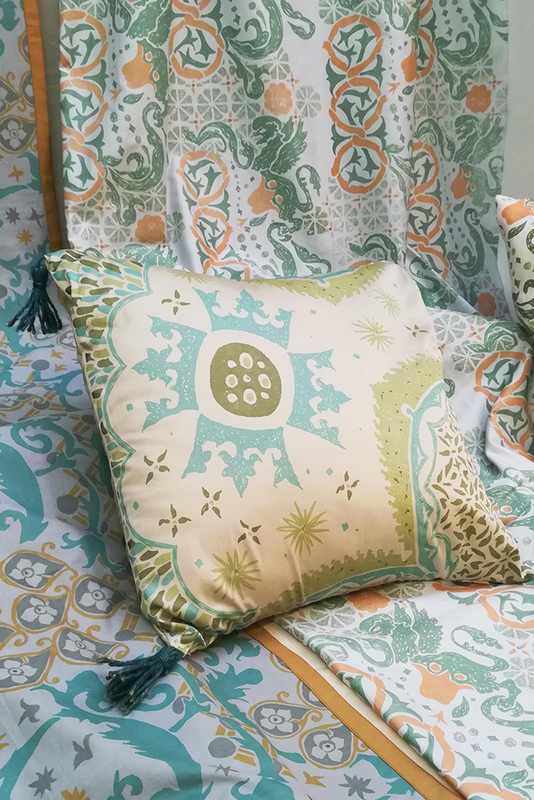 Clizia’s work won the Artigianato e Palazzo Blogs and Crafts award in 2018. Many artisans prefer to work outside of the city center, although they are still intimately involved in the Florence art scene. The fantastic, fashionable creations by Dejamis at Studio Pedetta involve complex combos of recycled and restyled fabrics and furs; “no new furs” is the mantra. At the workshop of Iris Ricami, find traditional Florentine stitchery and cutfabric motifs. For terra-cotta art – always from local clay – visit Pesci Giorgio & Figli.